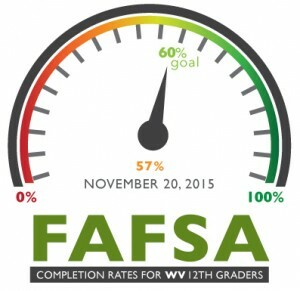 In January, CFWV set a goal of ensuring that at least 60 percent of high school seniors complete the FAFSA, which is the primary application for state and federal financial aid for college, by September 1. Students can complete the FAFSA anytime after January 1 in the year they intend to go to college. Filing the FAFSA allows students to be considered for the Federal Pell Grant which this year provided students with up to $5,775 to cover the cost of tuition and other education expenses. Students who file the form before April 15 will also be considered for up to $2,600 through the West Virginia Higher Education Grant Program. Additionally, completing the FAFSA is a requirement of applying for State scholarship programs, including the PROMISE Scholarship. More information about these programs and other financial aid opportunities is available at cfwv.com, the state’s free college-planning website. College and university partners across the state have been working with high school counselors to increase awareness of the FAFSA and help students and families complete the form. A complete list of FAFSA completion rates by high school is available at www.cfwvconnect.com/fafsacompletion.html.